OK so it isn’t pretty and it is a kind of khaki colour, but this soup is delicious. It packs a flavour punch enhanced by the caramelised flavours of onions and brussels sprouts and it is velvety smooth from the background of broken down potato. I like mine with a teaspoon of cashew cheese stirred through. It adds to the flavour and creaminess. Other good toppings are dill (I am currently in love with dill as a herb) and crunchy fried onions. 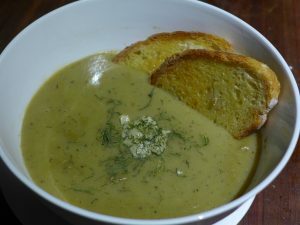 I made this soup on a recent nasty, windy, cold day in Melbourne with hail and rain pounding outside and it was lovely to sit with the bowl warming my hands and eating it with some crunchy sourdough toast. 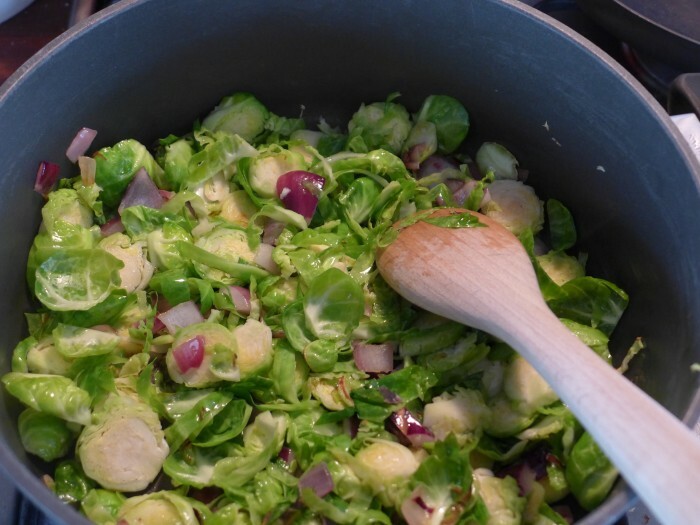 Trim the base of the sprouts and cut into ½ cm slices. Bring to the boil and reduce to a simmer and cook until the potato is falling apart. Blend until smooth using a stick blender or a blender. Serve garnished with any or all of the garnishes. Ooh I was thinking about brussel sprouts today, I haven’t had them in AGES!